Easy to put together and really nice looking! 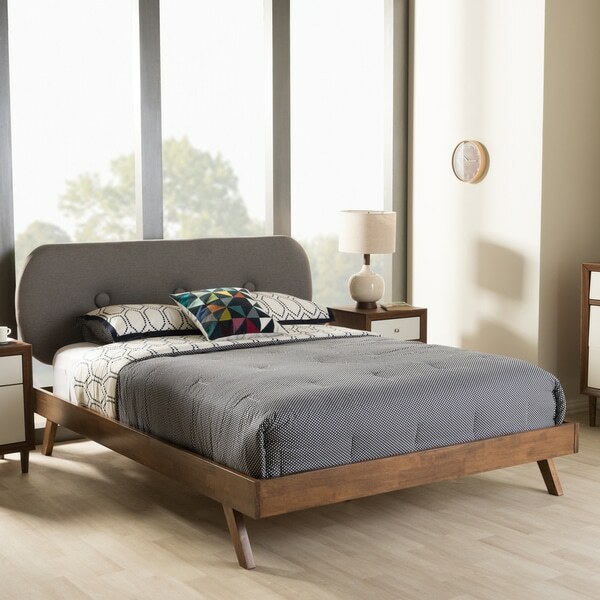 Add a funky accent to your mid-century bedroom with this platform bed from Carson Carrington. With a unique oval, button-tufted headboard, this bed frame offers a retro style that makes your room look clean and put together. Great bed! Pretty much got what I saw on the picture of the item. It comes with minimal instructions. It's pretty self explanatory, but the instructions are less verbose than even *** . Didn't matter much, but the fact there were missing washers and some screw sizes were extra was a bit confusing. Over all, GREAT bed with solid support and the wood color is top quality with deep dark finish. Smooth yet earthy feeling solid wood. Headboard is also great looking. One thing I would recomend is purchasing a mattress less than 11 inches thick if you don't want the headboard covered. My headboard is being covered by 2-3 inches from the bottom due to an 11 inch thick mattress. Would have loved to see the Headboard a bit higher and isolated, with queen sized pillows only 4 inches or so of the headboard is exposed and the buttons are pretty much all covered. The headboard is quite cushiony -- thickly padded. Overall I love the bed, a few things here and there, that's all. Absolutely love this bed. Nice wood, looks perfect in our room, and is solid construction. Doesn’t move an inch. I’m looking at the entire Strick & Bolton line for future furniture additions. Ordered king size which fit our mattress perfectly (Sleep Innovations Shiloh 12). The frame arrived in two boxes and the contents were well packaged, but not excessively packaged. We were worried about the headboard being too low, but it has two height mounting options and the highest one was perfect. (I do want to point out that the buttons are still half covered by pillows even at the highest height.) The slat system is great and each one runs the full width of the frame. This is much better than the half slats of our previous bed frame as they would sometimes move and fall out of place. We ordered the grey option which looks just like the photo, it's a very nice and even color. This frame is stable and sturdy. Wow! I am so happy I purchased this bed! I did my shopping beforehand &amp; the evil bookstore’s price was a bit lower the Overstock’s, but Overstock’s estimated delivery date was much quicker. For a few dollars more, I ordered it on Tuesday evening &amp; it arrived Friday afternoon, four days earlier than their original estimate. Not bad for free delivery! The bed comes in three large boxes. It was a bit clumsy for me to move it myself. You should ask someone to help you move it, especially if you have stairs. Other reviewers mentioned that the directions were difficult to understand as the directions comprised of illustrations with minimal words. For me it was easy to decipher &amp; I had the bed up in an hour. If you can put together Legos off a picture, you should have no problem. It does come with an allen wrench, but you will need your own philips screwdriver. I recently moved to a small, quirky lake house with a long, narrow bedroom. I like that the small footprint of this bed frame doesn’t overpower the room. I needed to put the bed under a window, so I wanted a frame with a headboard. The cushion in the headboard is pretty firm. I seems to be fairly durable. I like that the headboard is mounted back about five degrees, making sitting up in bed more comfortable. The legs are made of solid walnut &amp; the rest of the frame is a walnut veneer. I love the color. I love the design. I love this bed! 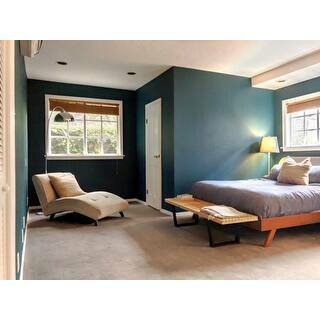 Sharp looking mid century bed. Item description lists rubber wood, but the base is heavy like real wood - nice color too. I did have one slight wood discoloration on a side slat, but you cannot see it since it's on the inside and under the mattress. Does not detract from the overall bed. *I am submitting this review based purely on assembly and aesthetic - this bed is for a rental house and has not been used yet. I ordered 3 beds and I will say that this one was a bit more complicated to assemble than the other 2. First, you will need 2 people because the fabric headboard attaches to the headboard slat and is a separate piece - not like the other beds. I assembled this by myself. It took longer than an hour due to the fact that one of the corner screws was threaded poorly and cannot be used. The bed is not finished yet. The hardware placement and assembly seemed more labor intensive on this frame - was not quite as smooth. There are screws that do not have pre-drilled holes - I believe it was the support bars as well as the slats. If you have a power drill it's not difficult. *Regarding the defective hardware - I contact customer service and they seemed very helpful and are in the process communicating if the needed screws are available in the warehouse. I feel confident that the issue will be resolved. That being said, nice looking bed. Just what we were looking for. 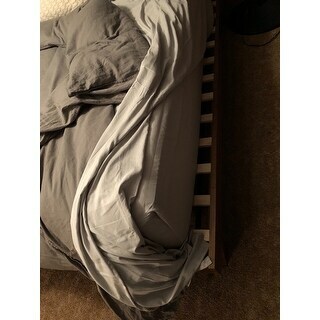 Bed came without a damage, every parts and pieces are there. Assembly a little bit challenging by 1 person but very doable. It took me at least 1hr. Quality is very solid, made of solid wood. I love the mid century modern look. Highly recommended. This bed was purchased for a guest room with the beige headboard option. Overall, it seems very sturdy and was quickly assembled by my husband. 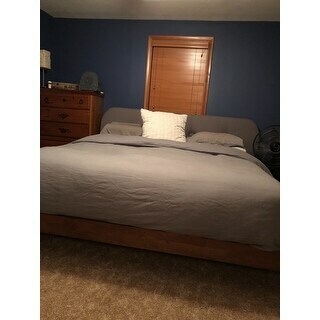 I purchased a 10.5 inch mattress from O to be used with it and the height was correct so that the headboard would not be covered with a higher mattress. There is some slight leeway with that, as the headboard can be slightly raised or lowered depending on your mattress height. I am waiting for my daughter to visit to give her opinion on it. 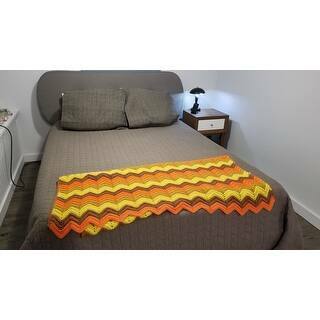 Overall it appears to be a good value and it goes well with the décor. I got this for our guest room and my husband and I both remarked on how that room is now nicer than ours! It's a great piece all around. It was a little challenging putting on the headboard on account of the allen wrench getting stripped, but we made it work. Nice quality. Headboard isn't super cushioned. Will need a drill! Very surprised by the quality of this bed. The wood is beautiful. The headboard well made. I expected much less for the price. I put this bed in the guest room and it looks great. I am a 57 year old woman and I put it together by myself with ease. The only issue was that the bag of screws and washers had broken open in the box during shipping so I was missing some washers. I went to home "debit" and picked up what I needed for a few bucks. I needed a headboard that could fit under the window. This one is adjustable so you can decide the height. You may want to make yours at the highest level. Because mine is lower to go under the window my new "giant" pillow top mattress sort of swallows the headboard but I still like it. Overall a great purchase and I am ashamed to admit I am a bit of a furniture snob. This is the first piece of furniture I have purchased online. If you like it get it ...its worth it. Wasn't able to put this bed together until a few days ago. Wish I had waited to order since the price has decreased so much. But overall I guess I'm happy with the purchase. It was very easy to assemble & everything was in the boxes & in good shape. The King size would easily fit a California King mattress. I have the Standard king size & it's a little wider than the mattress, but if you tuck in the bedspread it fits without being noticeable. It is very sturdy & looks nice & simple. Just what I was looking for. 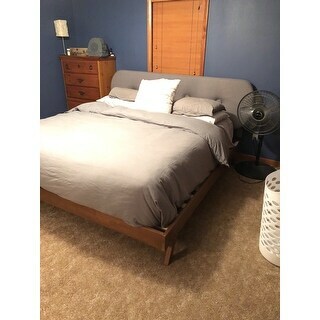 Other than the price I am very happy with the bed. The bed came without any assembly instructions at all. The quality of the bed is great from what we can tell. My issue is we bought an “Eastern King” mattress and this bed (we realized after assembly) is a California King so it does not fit right. I am disappointed that the description did not specify this. I really want the “Eastern King” because it is wider than a “California King”. Now trying to convince my husband to take it back (he does not want to have to take it apart and pack it back up) is going to be a chore. This bed *looks* great and was easy to assemble but I have fears that the legs may break under little-to-no strain. I could tell by even just moving the bed across the floor than the design of the legs are weak. Perfect addition to our Overnight listing. Gorgeous bed! Very visually appealing and matches the rest of our MCM furniture beautifully. Also seems sturdy and was fairly easy to put together (though you need 2 people). My only issue with the bed is that the frame seems a bit wide. Our king size mattress doesn’t quite fill the width of the frame so you can see some of the slats on both sides. With a comforter on, it’s not a big deal, but I wish it fit more snugly. I love this bed. It is very comfortable and looks great. Is light weight and easy to move for cleaning under and behind. I really love the finish, looks pricey. Sleek looking! The best purchase I made this year. Went together pretty easy. 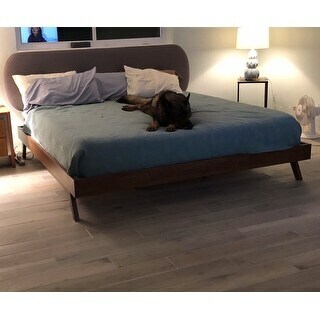 Have gotten many compliments on this bed. Bought the matching pieces but they are not as sturdy as the bed seems to be. I would not recommend buying this bed. The shape and quality of the headboard is cheaply done. I do however like the wood. It was pretty easy to put together. A little difficult to put together, but once it's done it looks fantastic. The frame is extremely sturdy and easily supports myself, my partner, and our rottweiler and great dane! My only complaint is that it does slide on my tile floor so every so often I have to scoot it back up to the wall. This bed is wonderful. Easy to assemble and fits great with our mid century theme. Matched it with the Madison Park writing desk for a small bedroom and it looks awesome! The product is as described. It fits perfectly in our space and seems substantial. We are looking forward to finding other pieces to compliment this one as we are furnishing our midcentury second home with period furniture. "The leg design looks precarious. Nice, but precarious. It the leg braced? " The legs are attached with washers and bolts. All of the hardware is provided for assembly. "Is the wood sustainably sourced or FSC approved?" "What is the weight capacity for King Size?" "Is the king size a standard eastern king, or a California king size?" That would be standard King size. "Is the headboard adjustable? I have a 16" king mattress and I am concerned it will cover the whole headboard." Unfortunately, the headboard is not adjustable. They have pre-drilled holes. "What is the distance between the slats. How many slates are there?" "What is the height of clearance underneath the king size bed?"